Waianae is honoring legendary coach Larry Ginoza tonight and will name its athletic complex after him. Quarterback Michael Beazley, left, said Ginoza wanted his players "to be humble and good in the classroom and the community." In 1965, a young man named Larry Ginoza took the reins of a Waianae High School football program that lost more athletes to the beach than to injuries or academics. Over the course of the next 20 years, Ginoza influenced a culture of football that lifted youngsters to higher peaks. He stepped down in 1985, but his impact is still felt through former players who have journeyed as far east as Washington D.C.
One of them is Sgt. Isaac Hoopii, a police officer at the Pentagon and former cornerback who graduated in 1981. Hoopii, who has worked in Special Ops Canine Duty for 15 years, was an unintentional hero on Sept. 11, 2001. He risked his life to pull several victims out of the burning Pentagon after terrorists crashed a hijacked jetliner into the building. Hoopii made the trek home this week to join the celebration tonight when Waianae High School honors Ginoza with a dinner at the Ala Moana Hotel. Though Hoopii is known for his heroics, it is the football field where he imparts the wisdom gained from his years as a Searider. "He is very ha'a ha'a. Very humble. He was an educator and when he taught, there was always a positive reinforcement afterward. He doesn't treat anybody different. He treats everybody equally," said Hoopii, who has coached at McClain High School in northern Virginia for six years. Former Waianae linebacker Nuuanu Kaulia agreed. "I feel like I owe him a lot. His program did a lot for my brother (Henry) and myself as far as moving on in life after football," Kaulia said. Henry Kaulia eventually became a teacher in Forest Grove, Ore., before his death in 2006. "If it wasn't for him, I wouldn't be the person I am today," said former Seariders quarterback Victor Humalon. "A lot of things in my life would've been very difficult." He was, and still is, a different kind of preacher. It began with Father Bray, who set the foundation for Iolani athletics with a mantra of "One Team" in the 1950s. One of Bray's pupils, 1954 graduate Larry Ginoza, took the credo with him through college and then westward to Waianae High School. Ginoza not only became an award-winning educator, but employed all of Bray's wisdom in turning a struggling football program into a juggernaut in his 20 seasons as head coach. Tonight, Waianae honors Ginoza with a banquet at the Ala Moana Hotel for his two decades as a coach and 10 years as athletic director. The school will name its athletic complex after Ginoza and also begin raising scholarship money in his honor. The wins and losses have passed, but Ginoza's legacy on the gridiron remains remarkable: nine Oahu Interscholastic Association titles between 1965 and '84; Prep Bowl victories in 1973, '77 and '78. The Seariders also had a tie in the 1980 Prep Bowl, against -- who else? -- Iolani. Now 71, Ginoza still loathes the spotlight after teaching students and athletes about the importance of humility, perseverance and unity. That doesn't stop his former assistant coaches and players from recalling his era with delight. Among them is all-state quarterback Michael Beazley, who was a sophomore when the Seariders won the '78 Prep Bowl. "He won't be the one to talk about himself, that's for sure. That's the way he coached us up. No rah-rah, just take care of business, shake the other team's hand, win or lose, and go home. Celebrate together. Watch your conduct," said Beazley, 45. "The same things my mom and dad were saying, he was saying," he added. "When you have a coach saying the same thing, you start thinking, 'Maybe my mother and father know something.' "
Ginoza became Waianae head coach in 1965, but did not experience instant success. 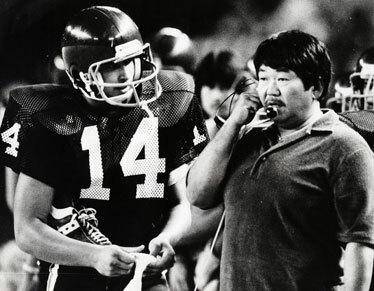 The Rural Oahu Interscholastic Association was all country, and head coaches like Ginoza actually drove their team buses to distant fields at Kahuku and Castle. "It was the old Father Bray parts that he brought with him," said Harry Mitsui, who joined the JV staff in 1964. "The Waianae kids are different from everybody else, so he had a lot of discipline and he believed in teaching the kids on the field. He had teachers coaching with him, and that was key for him, what he firmly believed." At the time, surfing prevailed over team sports as the No. 1 afterschool activity for many Leeward Coast youths. "His biggest challenge was getting them to practice," Mitsui said. The program grew even though Ginoza employed strict rules. "If you don't come to practice, you don't play. It was strict, but he was fair, too. That was the key," Mitsui said. "I guess another thing, when you start winning, the kids start to come out, too." Beazley saw a teacher and coach who walked the walk. "By the time we went there, it was established. Tui Ala, Manny DeSoto, Levi Stanley, Mike Vierra, Barry Castellano and those guys, those were the guys in the early and mid-'70s," he said. "We pretty much knew what was expected of us. The rules were enforced." Discipline, Beazley added, created a bond. "That's what brought us a little bit closer. We knew everything was fair. He was tough, but not rough. Fair, honest. He wanted us to be humble and good not only in the classroom, but in the community," he said. In the summers, Ginoza and his assistants often went to the mainland for coaches clinics. "The first one he went to was in Atlantic City. Then he went to Reno, where the Nevada athletic director, Chris Ault, had a clinic," Mitsui recalled. The evolution of Waianae's offense reflected Ginoza's knowledge. "When he first started, he was a Wing-T coach, and then he went to the option. He wanted to be a little different," Mitsui said. "When you work on that every day, just repetition, repetition, you get good at that." Another factor in Waianae's prolific offense was Ginoza's instinct and understanding of personnel. Beazley started three years at quarterback, adjusting from the wishbone to a split backfield, then featured the veer with a flanker who was virtually a slotback. Ginoza's son, Bryant, played quarterback in the mid-'80s and saw the flexibility of his father. "He didn't really change the offense, but he adapted to his personnel well. The best player would get the most carries," he said. Among them was Vierra, who was a featured tailback. Another was Wayne Tabangcura. "His junior year, they were in the wishbone, but in his senior year, they went to the I formation to use his abilities," said Bryant Ginoza, who has been Waianae's offensive coordinator for several years. Beazley began his career at Waianae as a 5-foot-11, 150-pound slinger, but eventually played linebacker at 212 pounds for the University of Hawaii. "Man, he's a genius. I just think he's pretty special. I'm not trying to be biased, but I guess I am. Not to take anything away from the coaches at college, but he was probably the best I ever played for, up there with the best," Beazley said. For Mitsui, as a teacher, coach and administrator, appreciating his old friend went beyond X's and O's. A lot of energy went into the three-a-day preseason camps. "He had a great compassion for the kids of Waianae. We used to have (fall) camp and the kids never paid a penny. He used to get donations from the community and the farmers. Three good meals and a snack at night. He knew some of the kids weren't getting good meals at home, so he provided for that," Mitsui said. "The kids used to really look forward to that." Ginoza could be surly and gruff, but his counterparts across the league and state had respect for a man who preached and practiced humility. "He never did run up scores, I can swear on the Bible," Mitsui said. "Any time we had a four-touchdown lead, we let in all the kids. Even if the other team scored, they stayed in. He was never a man of statistics." These days, Ginoza still attends Waianae football games, though his signature cigar is absent. "No more cigars for him," Bryant said. "His grandson (Devin) and granddaughter (Logan) are the apples of his eye. Everything is for those two. She bosses him all over the place."